WASHINGTON – The president of the nation's oldest Latino civil rights organization, the League of United Latin American Citizens, said he plans to retract a letter he sent to President Donald Trump endorsing the president’s immigration framework. Roger Rocha Jr., president of LULAC, told NBC News the retraction would be issued Wednesday afternoon, although the group's executive director said it would be Thursday. Meanwhile, the group’s board was to meet in coming days to discuss the letter Rocha sent that contradicted the group’s official stand on Trump’s four-prong immigration framework. "It will be retracted, the letter I sent out," Rocha said. WOW. Not really sure what @LULAC leadership thinks this letter supporting Trump/Miller/Kelly poisonous #immigration proposal will do, but CERTAINLY won’t help immigrants/Latinos/LULAC members. The letter had been cited by Senate Majority Leader Mitch McConnell, R-Ky. to show there was support in the Latino community for the president's immigration proposals, said Brent Wilkes, LULAC's executive director. In the letter, dated Jan. 28, Rocha said that the four pillars Trump had outlined - which he described as Border Security, DACA legalization, Protect the Nuclear Family and Elimination of the Lottery and Repurpose Visas - "are items that LULAC can support if they remain within the framework you have proposed." 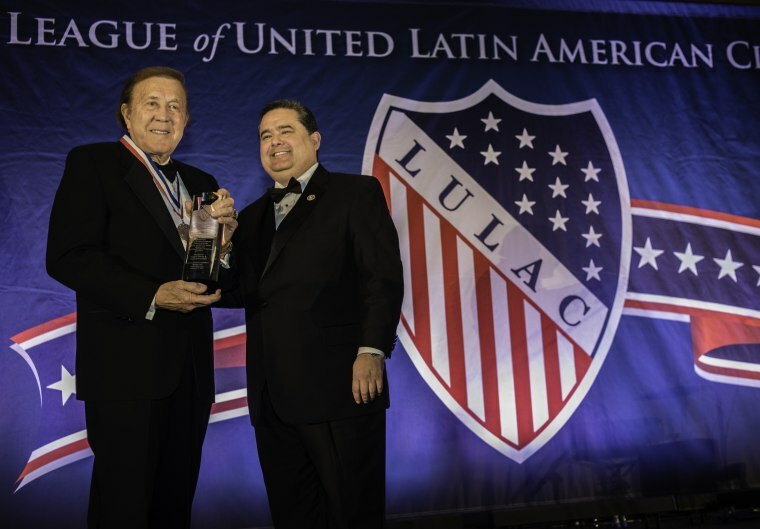 "As this country's largest and oldest civil rights organization, LULAC firmly believes that now is the time to move this country forward and what you have proposed will continue to keep the momentum of progress on its proper trajectory," Rocha wrote. He also thanked the president for "taking the lead" on immigration. Trump has said he's willing to support a path to citizenship for immigrants who have been or stayed in the country without legal permission since they were young children. But in exchange Trump wants Congress to approve $25 billion for a border wall, make massive increases in border security and enforcement, substantial reductions in legal immigration visas by limiting U.S. citizens and legal permanent residents to only sponsor children and spouses and to do away with the 50,000 diversity lottery visas, which are granted to people in countries with lower levels of immigration to the U.S. The group supports a "Clean Dream Act," which provides a path to citizenship for all Dreamers as stand-alone legislation and without enforcement measures. The National Assembly also has voted to oppose a border wall, to oppose reducing family migration, to oppose increased detention of immigrants and use of private prisons for detention and to oppose state and local government participation in immigration enforcement. Rocha said he thinks people misconstrued his letter and the framework he was discussing. He said it was based on an earlier fact sheet the White House released and not a more recent one with proposals the group does not support. He said he was asked by a group of Latino leaders that have been holding meetings and advising the White House on immigration to write the letter. He said the leaders include the Latino Coalition and are mostly business leaders. He said LULAC is the only Latino civil rights group "at the table." "That’s the important thing and that’s what people fail to realize, that of the Latino groups that are literally sitting at the table in these discussions and making the case for things to put in and things not to be put in, the Latino civil rights group that is there is LULAC." Wilkes said the letter "was never intended to go public." Rocha "didn't anticipate it would be shared with members of Congress," he said. There was quick backlash as the letter became public with members of LULAC councils across the country denouncing Rocha's views. As a member of @LULAC I can certify that our membership does NOT approve of this position. Our stance has been clear that we fight for a CLEAN Dream Act and will not settle for anything that degrades our basic human and civil rights. LULAC was founded in 1929 amid rampant discrimination against Mexican Americans. Its history includes challenging the exclusion of Mexican Americans on jury duty and it has played a role in a number of civil rights battles for Latinos, including voting rights, education access, immigrants' rights and pushing back on discrimination and racism. It is often considered a Democrat-aligned organization but the group is non-partisan. It has taken opposing views of other Latino groups over immigration in the past, notably in 2007 when it opposed a bipartisan immigration bill. Rep. Bernie Sanders, I-Vt., recalled LULAC's opposition during his presidential campaign to defend his vote against the 2007 comprehensive immigration bill. The organization has come under fire from some immigrant led groups that see it as an "establishment" group. The group, that has staffers who are immigrants and Dreamers, has been experiencing turmoil as Rocha has reached out to Trump. But LULAC has been an avid supporter of immigrants in immigration battles in recent years. "It's important to emphasize the long body of work we've done" on immigration, Wilkes said. "That is out there that we somehow are out of step, but the role of a large membership-based organization is more important than every before. "I would challenge any online groups that have issue with that." Wilkes said the group has brought some 800 people to the Hill to pressure members of Congress on immigration and other Latino issues and held 60 town halls around the country. "This is all in person stuff, real hard stuff," he said. Rocha's letter had some LULAC councils, its name for its chapters, trying to reassure the communities they serve and in particular immigrant groups. California State Director Dave Rodriguez said his members were lighting up his keyboard with demands that Rocha resign and that they had also sent Rocha letters making the demand. Members of Congress and community based groups that Rodriguez said LULAC has built a relationship with over decades, also were in an uproar. Rodriguez sits on the national board and he said Rocha's future would be discussed when it meets, but he said his duty is to represent his members. Rodriguez sent his own letter Wednesday to Rocha. He criticized the LULAC president's letter to Trump saying it "compromises our core values as an organization and our mission in protecting the Latino people." "In a time when California's immigrant population is reaching out to leaders for protection, the actions taken by our National (LULAC) President demonstrates horrible indifference and gives ammunition to those who are anti-immigrants," he stated.